By hungry runner on October 24th, 2012 . Filed under: Clothing, Gifts . I am always on the lookout for good gift ideas for my friends and family. 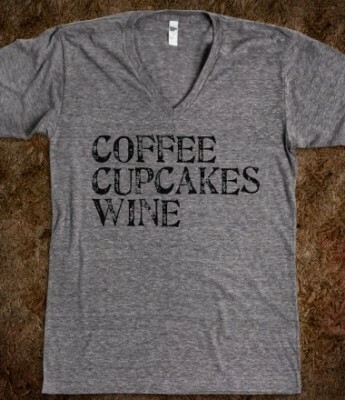 I came across this Coffee, Cupcakes, Wine t-shirt and know it would be perfect for some of my friends that love all three! This shirt sounds like the perfect foods to enjoy on a lazy sunday! The shirt costs $30.99 from Skreened and is available in several different colors. Pretty good post. I just stumbled upon your blog and wanted to say that I have incredibly enjoyed reading your blog posts. Any way I will be subscribing for the feed and I hope you post again soon.